This rich moisturizer is made with essential rose oils, and is specially formulated for use around the eyes and on extra dry or dehydrated skin. Along with moisturizing, this protein and enzyme-rich emulsion stimulates cell renewal. Apply to clean and dry face, eye, and neck areas. 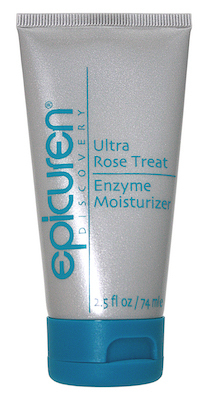 Can be used alone or in combination with other Epicuren products. Ingredients: Collagen and Hydrolyzed Elastin Amino Acids in an Enzyme Vitamin Protein complex with Niacin, Biotin, Riboflavins and Lecithin co-factors in a purified water borne blend. Natural Rose Essential Oils, Butylene Glycol, Glyceryl Stearate, Octyl Palmitate, Decyloleate, Sorbitan Stearate, Polyamino Sugar, Condensate, Sodium Lactate, Lactic Acid, Cholesterol, Panthenol, Triethanolamine, Aloe Carbomer-941 Tocapherol.